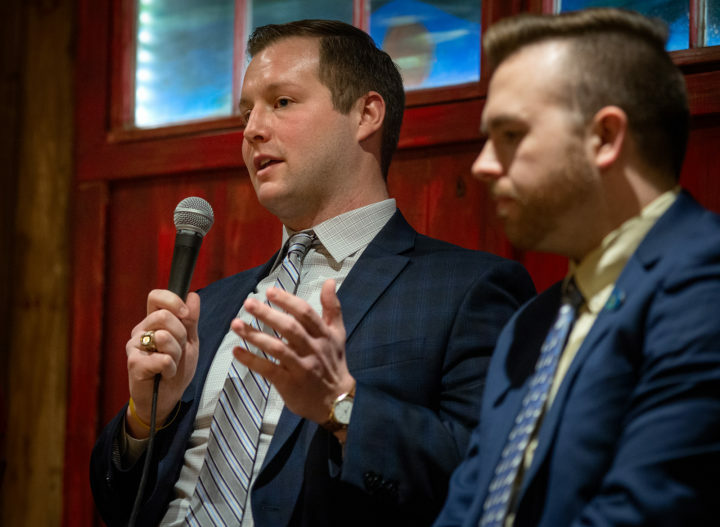 Two young state representatives discussed problems an aging workforce presents in Maine and what solutions should be and already are in the process of being implemented during a Bangor Daily News event Thursday evening. Rep. Ryan Fecteau, D-Biddeford, and Rep. Trey Stewart, R-Presque Isle, participated in a discussion led by BDN editorial page editor Susan Young and addressed audience questions about workforce development. 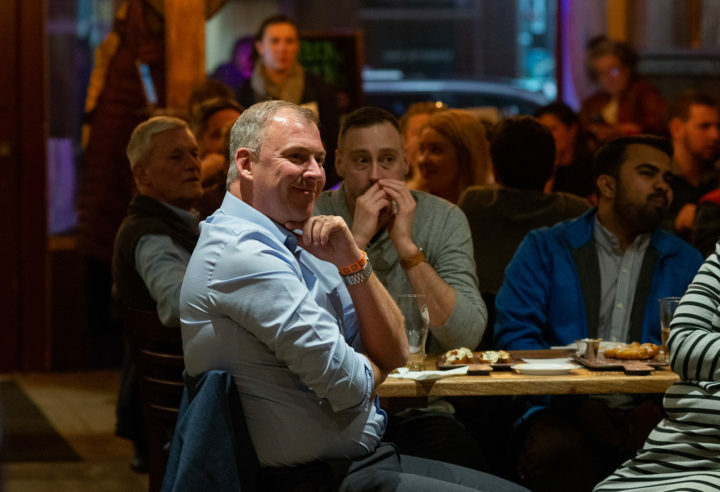 This was the first in a new series of events called Bangor Daily Brews, which are designed to be informal discussions at local bars or coffee shops that bring together legislators, businesses and community leaders to address important issues concerning Maine. Trey Stewart (left), R-Presque Isle, and Ryan Fecteau, D-Biddeford, discuss problems and solutions to an aging workforce in Maine at the first Bangor Daily Brews meeting that was held on Thursday at Black Bear Brewing on Exchange Street in Bangor. This year’s events will be framed around conversations about four topics: workforce development, rural living challenges, referendum reform and climate change. On Thursday at Black Bear Brewing, the two representatives from different political affiliations and areas of the state agreed on all the issues that the state faces and want to be part of the solution to attract and retain a young, skilled workforce to fill growing job vacancies across Maine. “I think I speak for every member of the Legislature when I say that workforce is an important priority for us,” Fecteau said. Fecteau, 26, and Stewart, 24, are some of the youngest members of the Legislature, and they both emphasized what Maine can offer young workers and what they can contribute to the economy. Fecteau left Maine to study in Washington, D.C., and returned to the state when he realized he could help address the need for young workers. Stewart also said that young people leaving puts a strain on remaining residents and raises property taxes, which contributes to an increased cost of living in rural areas. Both representatives believe that if the opportunities are communicated effectively to the graduating workforce in Maine, many will choose to stay and work. “Young folks in Maine can do whatever they want to do if they have the drive to pursue it,” Stewart said. Ryan Albert, Bangor Savings Bank, was one of the attendees at the Bangor Daily Brews meeting about workforce development in Maine and attracting young workers. This first time event was held on Thursday evening at Black Bear Brewing on Exchange Street in Bangor. This point led to a discussion on what employers need to change to attract a younger workforce to the state, and one key point was taking a chance on young employees who don’t necessarily have the experience or qualifications for the available jobs. Another solution to bridging workforce gaps that the representatives agreed on was using resources already available in Maine creatively. Fecteau explained that Biddeford breweries had taken advantage of old mill sites and built a successful business, and Stewart agreed that creative solutions using what’s available in abundance would be in the state’s best interest. The conversation also touched upon what changes the state government needs to make in order to develop a long-term economic development plan. “The system is almost set up to not work very effectively,” Stewart said, explaining that the turnover of politicians hinders the consistency of progress. The audience engaged with the speakers by offering suggestions and asking questions. Jacobson emphasized the importance of acquiring federal research funding, which would bring innovation to Maine, which in turn would bring skilled workers, he said. Stewart told the audience that while he believed that addressing the workforce-related challenges was important, so was highlighting the positive points. “We have to be brutally honest with ourselves about what the challenges are, but we also have to be relentlessly optimistic,” he said.